Antacids which are gastric acid-neutralizing or absorbing medications, used as indigestion remedies. They usually contain aluminium and/or magnesium salts (eg: aluminium hydroxide, magnesium carbonate, trisilicate or hydroxide) because these compounds are relatively insoluble and longer-acting. Antacids come as tablets, capsules, liquids or powders. Liquid and powder preparations are often more effective than tablets and capsules but they may be less convenient to carry around. Antacid-containing medicines are best taken when you get (or expect to get) indigestion symptoms. This is usually about an hour after a meal and when you go to bed. Avoid taking antacids at the same time as other drugs since they may impair absorption or have the potential to interact with many prescribed drugs. * Many common drugs' absorption is decreased - including some antiepileptics, antimalarials, lansoprazole, antivirals, digoxin, and antibiotics. * In particular, an alkaline environment can cause the precipitation of tetracycline antibiotics. Alginates form a raft that floats on the surface of the stomach contents and provide a physical barrier to gastro-esophageal reflux. Frequently, these are found in preparations combined with an antacid. Examples includ Acidex®, Gastrocote®, Rennie Duo®. Simeticone is often added to antacids as an anti-foaming agent to relieve wind - Asilone®, Maalox Plus®. The effectiveness of antacids and alginates has been questioned in a number of studies. There is a fairly large placebo response and only a negligible added benefit of antacids is suggested for long-term use. The occasional use of antacids as indigestion remedies have proven to be more effective. Additional medication such as H2 receptor antagonists (H2RAs) or proton pump inhibitors (PPIs) should be considered where symptoms are persistently reducing an individual's quality of life. 1. Tums or Rolaids. These antacids should be taken when indigestion symptoms begin. Take two to four chewable tablets to neutralize stomach acid and hopefully get fast relief from heartburn symptoms. 2. Pepcid AC. 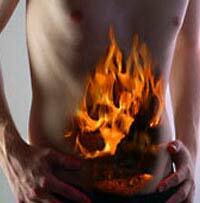 If certain foods or liquids cause your indigestion, use Pepcid AC ahead of time prevent heartburn from occurring. Take one tablet or gelcap fifteen minutes to an hour before the meal. If you forget to take Pepcid AC in advance, Pepcid Complete is available as an indigestion remedy at the onset of discomfort. 3. Pepto-Bismol. “It coats, soothes, relieves.” The pink liquid also comes in a pink pill and a children’s formula. For upset stomach, diarrhea, heartburn, and acid indigestion. 4. Mylanta. Johnson and Johnson has developed a line of Mylanta products in different strengths and flavors that neutralize stomach acid to relieve indigestion and heartburn. Take it before meals to prevent symptoms and at bedtime to alleviate them. 5. Alka-Seltzer. Alka-Seltzer has been used for upset stomach and acid indigestion for over 75 years. Two effervescent tablets are disolved in a glass of water and after several belches you can sing their ad jingle “Plop, plop, fizz, fizz, oh what a relief it is!” . 6. Prilosec OTC. Prilosec OTC is for frequent acid reflux sufferers, not for occational bouts of indigestion. If you have acid indigestion more than twice a week you should see your doctor and discuss using Prilosec OTC. It needs to be taken regularly to if you want relief. With an aging population, antacids and indigestion remedies are extraordinarily profitable for drug companies.